This week I want to share a new favorite chip of mine, the LT1970 power op amp from Linear Technology. This nifty device runs from a 36 V supply and can source or sink 500 mA. That’s not too unusual, but how about programmable current limiting, outputs to indicate over-temperature and over-current, and more? Think of it as a four-quadrant power supply on a chip, or as the source part of a source measurement unit. The first nice feature of the chip is the programmable current limit. The chip has two inputs, one for sourced current and one for sunk current, that accept a voltage from 0 V to 5 V. It compares these voltages against the current measured across an external sense resistor and limits its output when the measured current exceeds 1/10 the voltage on the relevant control pin. Differential input pins, independent of the output pin, are provided for the sense resistor. Another great feature is that the output stage has its own power pins. One of the neater “trick” circuits out there is to boost the current capability of an op amp by using the power supply pins to drive external transistors. An ordinary op amp without separate power pins can also be used this way, but the bias current of the external transistors will be proportional to the op amp’s quiescent current, which means one will probably need a low quiescent current model. By pinning out the output stage’s power pins, the LT1970 makes it easier. This circuit ends up running the output transistors in class AB. 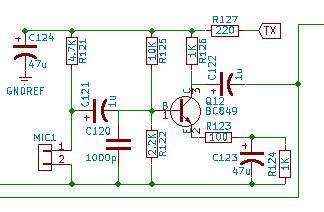 The bias current in the transistors is controlled, in part, by the quiescent current of the op amp. When the op amp tries to increase the voltage of its output, it will deliver more current to the output, pulling that current from its power supply. That, in turn, changes the voltage on the base of the upper external MOSFET, causing it to source more current as well. The equivalent happens when the op amp needs to sink current. Another advantage of choosing the LT1970 for this configuration, instead of an ordinary op amp, is that all stages except the output stage will see a stable power supply, keeping the PSRR up where it belongs. As for the last stage, when combined with the external transistors, it resembles two Sziklai pairs (also called “complementary Darlingtons”) biased into class AB. The separate power pins also make it easy to use a lower-noise supply for the input stages and a high-current supply for the output. I used them for another purpose: My application needed a wide input range but drove an input sensitive to overvoltage. Running the input stages off of 24V and the output stage from a lower voltage ensures the output will not hit an unsafe value. Watch out, though, because V+ and V- must be within the VCC and VEE supplies to the op amp’s input stages. Another neat feature is three open-collector outputs that indicate that the op amp has gone into thermal limiting, into current source limiting, or into current sink limiting. These pins can drive LEDs for an easy status display. The biggest drawback of the LT1970 is its package, a 20-pin TSSOP with a thermal pad on the bottom. That thermal pad means you pretty much have to have either a hot air or reflow setup to solder it. As you might expect for a part like this, there are ways to use it beyond the obvious. 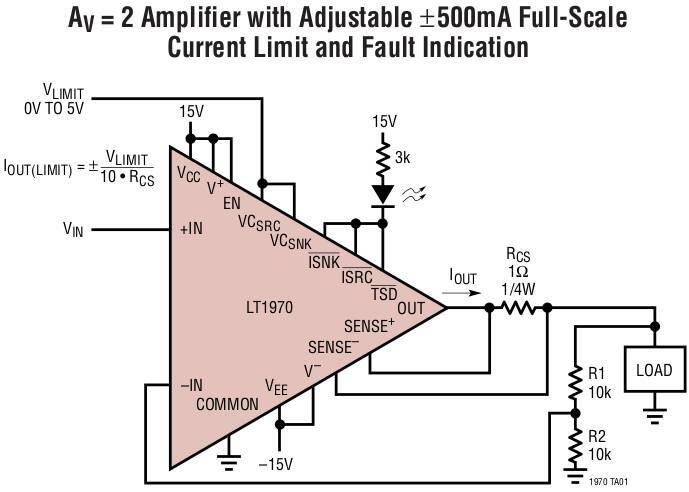 The current-limiting flag outputs can be used for snap-back current limiting, where the output current is sharply reduced after it enters limiting. 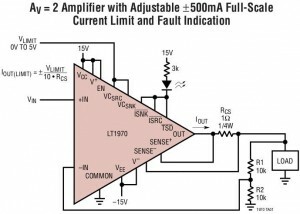 The current sense pins can be used as voltage-limit inputs, enabling circuits like a symmetric, voltage-controlled limiter. These ideas are from the data sheet; I haven’t tried my creativity at coming up with other ways to (ab)use the chip. No, I used the chip for a boring old power supply. It was a two-quadrant supply, though, meaning (in this case) that I needed a positive-output power supply that would either source or sink current to maintain its output voltage. The voltage was controlled by an analog input. What I needed was basically just an op amp with current limits and a few hundred milliamps output. The LT1970 was perfect. I fitted it with potentiometers to adjust the current limits, a set of LEDs for the status outputs, and as much PCB copper as I could manage for a heat spreader. I also included some compensation for capacitive loads. It worked great. I haven’t had any issues with oscillation, the LEDs have been handy to tell me when I mess up, and the current limit has saved my bacon at least once. Sure, I could have built the same supply from separate parts for a lower cost, but it would not have been nearly as easy or as quick. This is another case where it was worth spending a little money on a chip in exchange for saving a little engineering time. 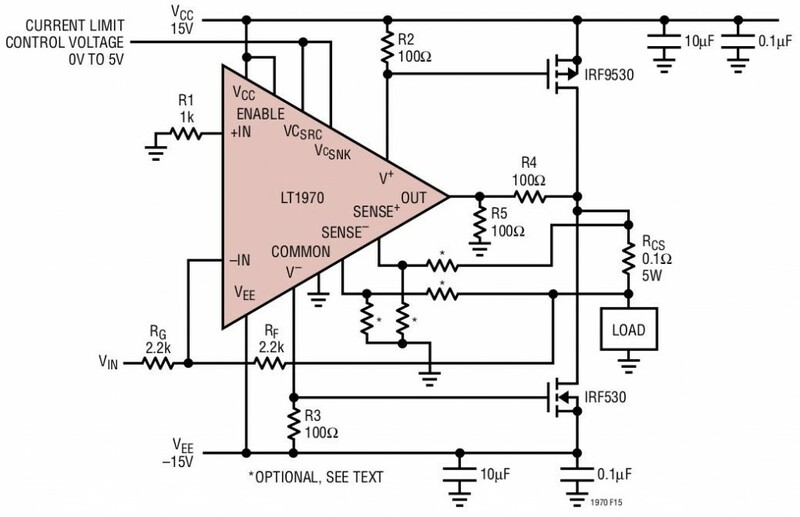 The feature I miss most from the LT1970 is a current amplifier output. It does current measurement internally, for the current limit feature, but a voltage proportional to current is not brought out. For my power supply, I had to add an external difference amplifier to measure the output current. The difference amp used the same current sense resistor as the LT1970, but it would have been nice to have that function built in. The quantity 1 price for the LT1970 is $9.88 from Digi-Key or $6.05 directly from Linear Technology. Figures: Copyright 2002 Linear Technology Corporation. Used by permission. Some time ago, I wrote, “The Actel/Microsemi parts have one additional advantage: They have the best static power consumption in the industry.” I was wrong. Last month, a post on the geda-user mailing list alerted me to SiliconBlue Technologies and their line of ultra-low-power FPGAs. These FPGAs are RAM-based, like those of the big two FPGA manufacturers, Xlinix and Altera. Unlike the chips from the big guys, though, SiliconBlue’s parts are not power hogs. In fact, they are fully static and go down to microamps with a static clock. With the Microsemi (Actel) FPGAs, one has to freeze the FPGA with the “Flash Freeze” feature to get down to that level, but it appears that the SiliconBlue units simply clock right down there. If true, that would give them quite an edge in power-conscious design. Making a direct comparison between the Actel/Microsemi Igloo line, their lowest-powered, and the SiliconBlue parts has to be done on a case-by-case basis. The clock rates, and in particular, how often the clocks can be stopped, matter a lot. There is also the external configuration EEPROM for the Silicon Blue parts, which will take power in simple designs, but can be powered down or perhaps eliminated in more sophisticated uses. In any event, I will stick with the Microsemi ProASIC3 and Igloo line for now. I like the convenience of a flash-based architecture. The next time I’m designing for low power, though, it will be time to give SiliconBlue a good look. Updated 5/12/11: The date of the geda-user post was corrected. Freescale has introduced a very nifty part, the MC13260 SoC Radio, where SoC is “System on a Chip”. Picture for a moment a complete transceiver on a chip, including an 100 MHz ARM processor, a programmable DSP modem, a frequency synthesizer, a transceiver, a USB interface, an audio CODEC (for the microphone and speaker), and miscellaneous support components, all on one chip. The thing operates at RF frequencies from 60 to 960 MHz. It’s designed primarily for analog FM and certain digital modes, but with an external modulator it can support linear modes, presumably including SSB. Output is only 5 dBm, so the advertised “few external components” had better include an amplifier! Though the chip is aimed at the military and commercial markets, hypothetically it could make the fine foundation for a fine amateur transceiver for any or all of the 2m, 1.25m, 70cm, or 33cm bands. Imagine an all-mode 2m, software defined radio HT with built-in data capabilities, for example. Integrated parts like this usually can’t achieve the performance of a discrete design, but the reduced part count would be worth the tradeoff. What do you think? 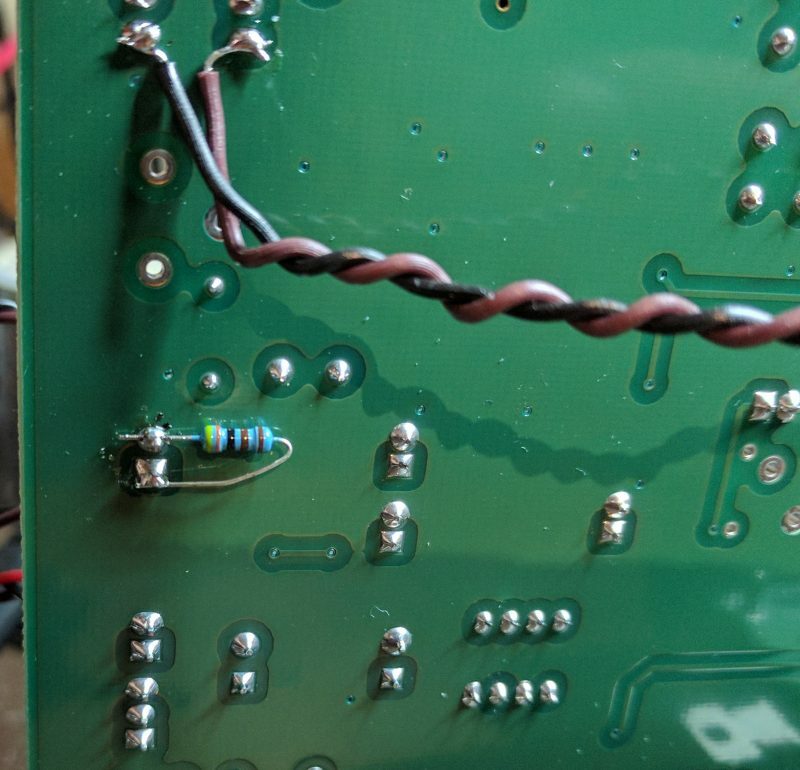 Would a transceiver based on a part like this be within the reach of a few dedicated homebrewers?